This is a three-bedroom, loft style, split level condo with ground floor entrance. King bed in master suite with full bathroom, downstairs. The second bedroom is upstairs with a queen bed. The third bedroom is a loft with two twins. A "Jack And Jill" bathroom is upstairs between the second bedroom and the loft. Enjoy the large, open living room, dining and kitchen areas with cathedral ceiling and a real wood burning fireplace. The loft style third bedroom has its own private terrace, with a table and chairs. Wonderful top of the line kitchen and bathroom amenities. Cable TV in living room and downstairs bedroom. Approximately 1,289 square feet of living space ensures your comfort. This wonderful, private condo has been professionally designed and furnished. Everything you need is here to guarantee the best vacation! 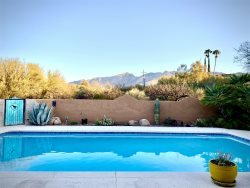 Ventana Vista is a gated community just two minutes from Sabino Canyon. Enjoy the heated swimming pool, tennis courts, fitness center and more! You have access to all of the amenities during your stay.